Dominant with a distinct style, the Renault Kadjar breaks new design boundaries. Practical in both an urban setting or for exploring the great outdoors, the Kadjar enjoys sophisticated versatility, switching between 4x2 and 4x4 modes to create a sporty and compact crossover. The exterior features a striking front end that hosts a grander adaptation of Renault's full-length headlamp and grille, with fluid lines that flow softly along the side of the car merging into an elegant rear to produce equally athletic and attractive dynamics. Advancing on the Renault Captur, the Kadjar is also family-sized and is Renault's first ever C-segment crossover. Built with high-quality materials and designed for comfort, the Kadjar comes with chrome roofrails, full LED technology, a 19cm-high ground clearance as well as front and rear skid plates and a stainless steel boot sill guard for enhanced protection. Packed full of the latest technologies, you'll find Renault's new R-Link 2 multimedia system with 7" screen, voice recognition and activation, Bluetooth and smartphone based apps and electronic driver aids including a TomTom Naviagtion system, Blind spot warning, Road sign recognition, Emergency brake assist, Lane departure warning, Speed limit alerts and Hands free parking with rear parking camera and engine stop/start. A safety conscious and spacious crossover, the Kadjar is also class-leading in terms of CO2 emissions and fuel economy with the dCi 110 being most economical model offered with emissions of just 99g/km and a fuel economy of 74.3mpg. The interior cabin will also impress with its stylishly sporty yet refined feel. Using soft-touch materials and double-row decorative stitching throughout, an optional 1.4-square meter fixed glass sunroof, effective noise insulation and ergonomic seats the Kadjar is also practical showcasing a 60/40 split rear bench that allows the compartment to be divided into two or three sections alongside an adjustable boot floor maximising space to 472 litres if required. 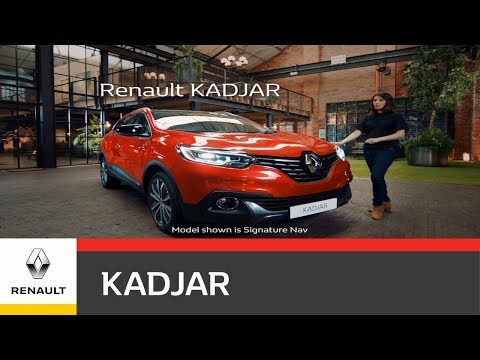 In terms of traction, the Kadjar is offered in a choice of two-or-four wheel drive, where two-wheel drive models come equipped with an Extended Grip system and all-wheel drive models offer three specialised modes including Auto, Lock and 2WD.